Source: CICH graphic created using data adapted from Statistics Canada. Canadian Health Measures Survey, 2009-2011, Custom runs. One hundred percent of Canadians have urinary creatinine-adjusted mono-benzyl phthalate metabolite (MBzP) concentrations that meet or exceed the limit of detection. 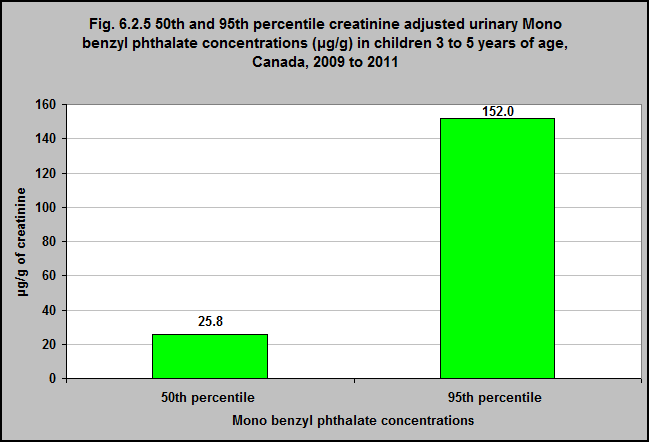 The median (50th percentile) creatinine-adjusted urinary mono-benzyl phthalate concentration among 3 to 5 year-olds in Canada is 25.8 μg/g of creatinine. The 95th percentile concentration for 3 to 5 year-old Canadians is 152 μg/g of creatinine. 3 to 5 year-olds have the highest concentration of all age groups. 1Phthalates Regulations. (Current to February 28, 2017). SOR/2010-298. Government of Canada. http://laws-lois.justice.gc.ca/PDF/SOR-2016-188.pdf– accessed March 20th, 2017. 2United States Environmental Protection Agency. (2013). America’s Children and the Environment, Third Edition. https://www.epa.gov/sites/production/files/2015-06/documents/ace3_2013.pdf – accessed March 12th, 2017.